ARM FINISHES TERRAIN ACTIVITIES AND MVR TAKES OVER FURTHER OPERATION. Macedonian Defense Ministry spokesman informed Tuesday that the Army finishes its activities on the terrain and Macedonian Interior Ministry will take over the further activities. Within the joint operation between ARM and the Polish troops of KFOR, a link is being established between the village Gracani in Macedonia and village Krivenik in Kosovo. ARM patrols the roads in the area of Tetovo and destroyed the bunkers and hideouts used by the terrorists. The terrain in the Kodra Fura area has been also checked. The demobilization of the first deployed units started Tuesday, but meanwhile another mobilization started. According to Trendafilov, the Government adopted important documents about the Macedonian Army such as the programs on computer digitalization and determining of the marsh routes of the tanks' units. "That is very important as it will raise the precision of the ARM's activities as well as the safety of the civilians, the soldiers and the facilities. The second adopted document is to computerize the mobilization system," Trendafilov stated. Trendafilov announced the meeting of the Defense Ministers of Croatia, Turkey, Yugoslavia, Greece, Romania, Bulgaria, Italia, Macedonia as well as delegations from NATO and KFOR, which is to take place in Skopje, April 5. The meeting will focus on the geo-political situation in the region and the emergence of new forms of crisis, civilian control over the armed forces as a component of political institution's responsibility in the decision making process and resolving the problems. The perspectives of the regional cooperation and stability as well as the regional cooperation along the borders will be also discussed. Within the transformation of the overall defence system, the draft plan on the professionalization and training of the Army staff, was presented before the Macedonian Government and Macedonian President Boris Trajkovski. According to this document "the First Infantry Brigade will be supplemented with more professional soldiers and will be restructured as quick reaction forces." According to the National Program for NATO membership, the Interior Ministry Forces will secure the borders. "It is expected the number of professional soldiers to increase. The military service is due to be reduced," Trendafilov stated. Within the military education, officers can be selected and trained even after they have completed the civilian high schools, whereas the noncommissioned officers will be selected from the professional soldiers. By the end of the year, it is expected the specialized police and military forces to act together in the antiterrorist activities. Asked about the information on the alleged messages from the terrorists in the area of Kitka, Trendafilov answered that the journalists should address to the Interior Ministry. "The Army does not hold any captives as they are delivered to the police. The Army will follow the dynamic of the exhumation of the graves found in western Macedonia, which will be undertaken by the Interior Ministry and the Public Prosecution on," Trendafilov stated. TRAJKOVSKI-ROBERTSON: VIOLENCE MUST NOT BE USED FOR ACHIEVING POLITICAL GOALS. Today's meeting is a proof of already established friendship, partnership between Macedonia and NATO, as well as of the strengthening of the cooperation, Macedonian President Boris Trajkovski said at a press conference with NATO Secretary General George Robertson. Late Tuesday, Skopje hosted a meeting between a Macedonian delegation, led by President Trajkovski, including Prime Minister Ljubcjo Georgievski and several members of the Macedonian Government, with a NATO delegation, led by Robertson, which included the Ambassadors of North-Atlantic member countries. Expressing satisfaction with the constructive meeting, Trajkovski said it reiterated Macedonia's aspiration to full NATO membership. "The Republic of Macedonia is NATO partner as it want to build a state, based on the rule of law, respect of the right of freedom of each person, and on market economy," Trajkovski said. He said that NATO Council had made it clear that the current situation also represented a challenge and an opportunity to strengthen Macedonia's statehood and democracy. "Macedonia is strongly committed to build a civic, democratic society, and to defend its territorial integrity and sovereignty," he said, adding that the country would improve its security system in cooperation with NATO and other friendly countries- at a bilateral level. Giving credit to KFOR success in securing the border, Trajkovski said the cooperation between Macedonia and NATO in hindering of the crisis would continue. Seizing of the illegal weapons in Kosovo and Macedonia was also discussed at the meeting. "We also expect regular dialogue with the Kosovo politicians, to point them out that they should not interfere in the Macedonia's internal affairs. The dialogue is also aimed to prevent the attempts of some structures to connect the situation in Kosovo with the current development in Macedonia," Trajkovski said. He said that Macedonia continued to ask assistance for equipping of the security forces, particularly in border control and anti-terrorism training. Simultaneously, the talks with all political parties of Macedonia were intensified, Trajkovski said. "There are certain differences at all levels. But, care must be taken for protection of the country's territorial integrity and sovereignty, and for long lasting stability and security of Macedonia and the region, as well as for the strive towards the European values and standards," Trajkovski said. "Therefore, we must built a society in which all peoples, regardless their ethnicity will be citizens, who will not only be loyal to their own country, but will also bear responsibility." he added. As an aspirant country to NATO membership, Macedonia would continue to work in compliance with the Action Plan for NATO membership, expecting the Alliance's support, as "Macedonia's membership into NATO will enhance the stability and security not only of the country, but also of the entire region." According to Robertson, the Macedonian political leadership achieved great progress in the past eight days. He expressed his satisfaction for the possibility that was given to NATO Council's members at Tuesday meeting, to express their solidarity with Macedonia, show optimism and to incite the process of further integration of Macedonia into the Euro-Atlantic structures. "The policy of proportion pays off because the extremists are retreating. The country avoided the creation of dangerous revenge passions, which would have only made deeper scars in the society, and would have started yet another cycle of violence, known to well in the Balkans" Robertson said, adding that further measures should be taken, in order to add political progress on top of military success. According to Robertson, it would mean intensifying the political dialogue, and it is of crucial importance to involve all political parties in Macedonia in this process, and thus show that democracy can yield with results. "All of us, both the international community and the Macedonian politicians, should marginalize and isolate those people who use violence to achieve political ends" Robertson pointed out. "Those politicians who support the armed extremists will become as isolated by the international community as those extremists above Tetovo have been" Robertson warned. George Robertson informed that KFOR would further enhance the control of the Kosovo part of the border between Macedonia and Yugoslavia. He emphasised the fact that he has demanded from the countries-members of NATO to provide one thousand of additional soldiers to be positioned at the Macedonian northern border. "I am very satisfied with the fact that those countries offered even more additional troops, all sophistically equipped" Robertson said. "The terrorists attacked the interethnic relations in Macedonia, It was an attack on democracy and on the territorial integrity and sovereignty in the Republic of Macedonia. It is more than obvious that the logistic, as well as the ideological support to the extremists have come, and still come from Kosovo. Yet, the possibility that Macedonian citizens are involved cannot be excluded" President Trajkovski answered the journalist question whether the events in Tetovo and at Macedonian northern border are an internal problem of Macedonia. 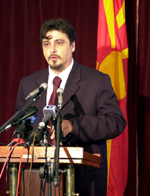 In relation to the demand of PDP to include the representatives of the so called NLA in the political dialogue, Trajkovski pointed out that political dialogue of the legitimate political parties represented in the Macedonian Parliament had already started, and rejected the possibility of involving anybody out of the Parliament in the dialogue. George Robertson completely supported this position of President Trajkovski. "Do not make comparisons between what happened in Kosovo, the ethnic cleansing of Slobodan Milosevic, and the situation in this small democratic country. It is not appropriate to make such comparisons, and I will not allow such comparisons. The situation in Macedonia, where certain people use violence to achieve political changes in a democratic country, is very much different from the situation of non-democracy that existed in Kosovo. KFOR is fully responsible for what goes on in Kosovo, according to the Resolution 1244, including the border control" Robertson said to the journalists. Asked what happens to the terrorists were arrested by KFOR on their retreat from Macedonia, and whether they would be handed over to the Macedonian authorities, NATO Secretary General said that UNMIK is responsible for the persons suspected of participating in the events in Macedonia. NATO FULLY SUPPORTS MEASURES FOR PROTECTION OF MACEDONIA'S INTEGRITY. NATO Secretary General George Robertson along with 19 Ambassadors of the Alliance member countries express full support to the measures Macedonia has been taking to deal with the current situation. The NATO Council, headed by Robertson, held talks Tuesday in Skopje with Macedonian President Boris Trajkovski, Prime Minister Ljubcho Georgievski and Foreign Minister Srgjan Kerim. The purpose of the meeting was a "to express solidarity with the country that NATO considers its partner", Robertson said. 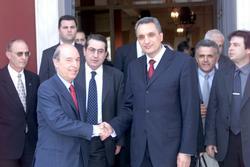 He also gave credit to the multi-ethnic model of Macedonia, as a good example for other countries in the region. In that respect, he said the informal document that President Trajkovski had presented to the political parties' leaders yesterday, and is to be discussed next week, was a proof that talks in the multi-ethnic Macedonia could be carried out through the governmental institutions. Robertson reiterated the support to Macedonia's territorial integrity and sovereignty, stressing that tomorrow in Pristina, he and members of the NATO Security Council would clearly present their position against any kind of violence and extremism. KFOR would take additional measures to secure the border against infiltration of extremists in Macedonia, and take part in the action for seizing of weapons in Kosovo. The NATO Ambassadors said they did not forget Macedonia's support of NATO in 1999, during the Kosovo crisis, and hailed the signing of the Stabilization and Association Agreement (SAA) between Macedonia and EU, scheduled for April 9 in Luxembourg. The officials also agreed on the necessity for better control of the border, which would be for the benefit not only to Macedonia, but also to the entire region. Trajkovski presented the measures that Macedonia had been taking for protection of its territorial integrity and sovereignty, while Georgievski urged for faster implementation of the SAA. Earlier, upon arrival to Skopje, Robertson said that extremists had chosen arms instead of ballot box. "There is no future for them in the Balkans, as they are manipulating with this, and with some other country, " Robertson said, adding that they would end up as former Yugoslav president Slobodan Milosevic. TRAJKOVSKI: THE DISCUSSIONS CONTRIBUTE TO THE NORMALIZATION OF THE RELATIONS. President of the Republic of Macedonia Boris Trajkovski said after today's third meeting with the leaders of the political parties that he presented a document on the current security situation in the country and on the activities that would follow after the signing of the Association and Stabilization Agreement with the EU. "We need to stress that the signing of the agreement, which will take place on April 9 in Luxemburg, was hailed by all political parties," the President said. He explained that the document points to the need of intensifying the activities that contribute to the overall harmonization of Macedonia's standards with those in the EU. "The integration in Europe does not mean that we will immediately feel the effects from the welfare. We need to have a lot of tolerance and to think maturely, both for our own interests and needs and for the interests and needs of the others," Trajkovski said. "Considering that Macedonia was attacked by a military extremism, that maybe was directed to resolve the interethnic relations, despite the commitments to address all necessary issues that someone allegedly said in order to fulfill his/hers human rights and freedoms, I think that it did not satisfy the militant extremism and it still has influence on the internal relations in Macedonia," Trajkovski said. "I think that the discussions between the President and leaders of the political parties in Macedonia, besides the existing differences are contributing toward stabilization and normalization of the relations in the country," the President stated. He stressed that as a President of the Republic of Macedonia, he would continue urging national interests that contribute to the strategic lines, such as the stability and security of the country, its territorial integrity and sovereignty and integration of all national minorities into the society as well as adopting European values and principles. President Trajkovski and leaders of the parliamentary political parties regretted for the absence of the Party for Democratic Prosperity from the meeting. Bulgaria could send peacekeeping troops to Kosovo. For the time being, sounding out is going on about eventual sending international Balkan peacekeeping troops, whose headquarter is in Plovdiv, to Kosovo, Premier Ivan Kostov said after his meeting with the Greek Premier Kostas Simitis. These troops could eventually take some of the KFOR positions, so that more KFOR troops could be used to patrolling the border between Kosovo and Macedonia, the News.bg Agency special envoy to Greece reported. The two Premiers have discussed the Greek plan for recovering the Balkans. Greek Parliament should vote a mechanism for raising funds to be used under the recovery plan by the end of April. Macedonian Forces Clash With Gunmen Above Tetovo. SKOPJE, Apr 3, 2001 -- (Reuters) Macedonian security forces exchanged fire with a group of gunmen trying to enter a village in the hills above the city of Tetovo on Monday, injuring one, Defense Ministry spokesman Georgi Trendafilov said. He said the gunmen tried to enter the village of Selce via an unauthorized route in the late afternoon. When challenged, they opened fire on Macedonian security forces. "We retaliated and wounded one of them while the others fled into the forest," Trendafilov told Reuters. The wounded man, not yet identified, was now in a military hospital in Skopje. He said soldiers were pursuing the remaining gunmen. Selce was believed to be one of the headquarters of the ethnic Albanian rebel group which launched an armed insurrection in Macedonia's northern hills more than a month ago. Last week the Macedonian army said it had driven the guerrillas back from their mountain hideouts across the border to the neighboring Yugoslav province of Kosovo. Council of Europe Denounces Police Violence in Macedonia. STRASBOURG, Apr 3, 2001 -- (Agence France Presse) The Council of Europe on Tuesday expressed concern about police abuse and violence in Macedonia, particularly against the former Yugoslav republic's ethnic Albanian and Roma minorities. "Although the situation is improving due to efforts of the ministry of the interior, unlawful arrest and detention, excessive use of force and physical ill-treatment of detainees remains a problem," a report by the European Commission against Racism and Intolerance (ECRI) said. The ECRI report, which was adopted in June last year after a fact-finding mission to Macedonia in March, also called on the government to intensify its efforts to improve integration for ethnic minorities, in particular Albanians. While the report admitted the government was aware of the need to encourage further integration, it said: "The organizations and associations of civil society ... are in large part divided along ethnic lines, as are the political parties." It also noted that Albanians and other minority groups were greatly under-represented in state-institutions at the national and local level, police and judiciary. ECRI is a Council of Europe body which monitors and analyses racism and intolerance in each of the pan-European body's 43 member states.